Doors open at 6 pm [Note the Change], show at 8. 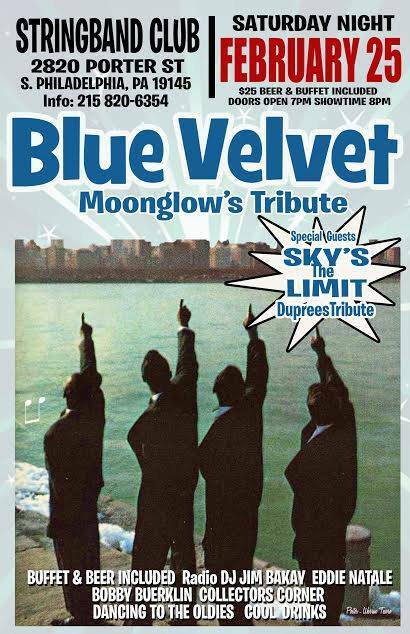 On Saturday night, February 25, the South Philly String Band Club, 2820 Porter Street in South Philadelphia, will present Blue Velvet doing a tribute to the Moonglows plus Sky’s The Limit with a Duprees tribute. Classic Urban Harmony’s Charlie Horner will give a brief bio of the Moonglows before Blue Velvet performs. Tickets are $25 and include beer and a buffet, plus dj Jim Bakay spinning music for dancing. Doors open at 6 PM, show at 8. For info call 215-820-6354 or email Eddie Natale at eddie7792@gmail.com.